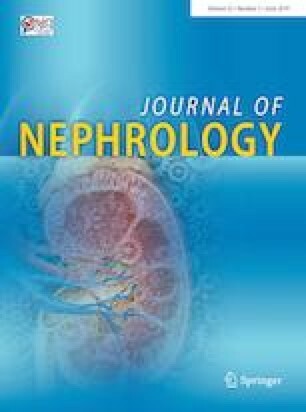 Risk factors for renal function deterioration in the general population are not fully understood. We aimed to clarify the determinants of estimated glomerular filtration rate (eGFR) decline using a community-based cohort. Among 3217 subjects who underwent repeated health check-ups, we excluded 478 subjects with eGFR ≤ 60 mL/min/1.73 m2 and examined 2739 subjects. EGFR decline rate was calculated from the difference in eGFR between the first and last visits. EGFR decline, which was defined as a drop in GFR accompanied by a 25% or greater drop in eGFR from baseline and/or a sustained decline of more than 5 mL/min/1.73 m2/year, was observed in 209 subjects (7.6%). Anemia according to the WHO definition (16.7% vs. 11.7%, p = 0.03), and proteinuria (3.3% vs. 0.8%, p < 0.001) at baseline were more commonly observed in subjects with eGFR decline. Multivariable logistic regression analysis showed that anemia and proteinuria were independently associated with eGFR decline. Anemia and proteinuria were closely related to eGFR decline, which suggests that we should consider these parameters as risk factors of the development of renal function deterioration even in the general population. The online version of this article ( https://doi.org/10.1007/s40620-019-00605-2) contains supplementary material, which is available to authorized users. Many thanks to all staffs of the Center for Preventive Medicine at The University of Tokyo Hospital. This study was approved by the Medical Ethics Committee of The University of Tokyo and was performed in accordance with the Declaration of Helsinki. Informed consent was obtained from all individual participants included in the study by the opt-out procedure.